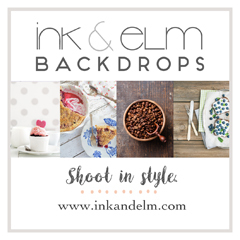 I read that in 1901, the first recipe for a peanut butter and jelly sandwich was published in a Boston cooking school magazine, and its fame has spread ever since. And it's been a popular combination for over a hundred years for good reason; salty creamy peanut butter and sweet fruit preserves are perfect together. My favorite way to eat it is on hearty, grainy bread, toasted, so that the peanut butter melts against the warm bread and mixes with the jam into a gooey filling. 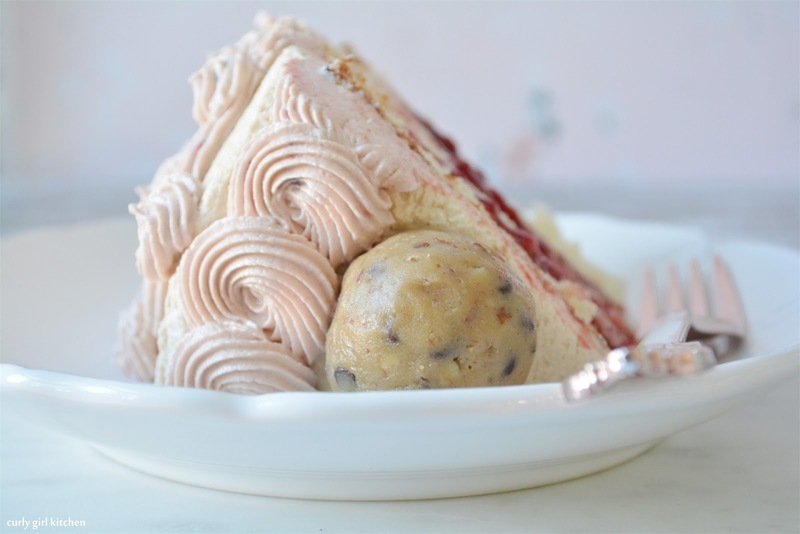 And while the sandwiches are classic, this cake, though, is something else entirely. 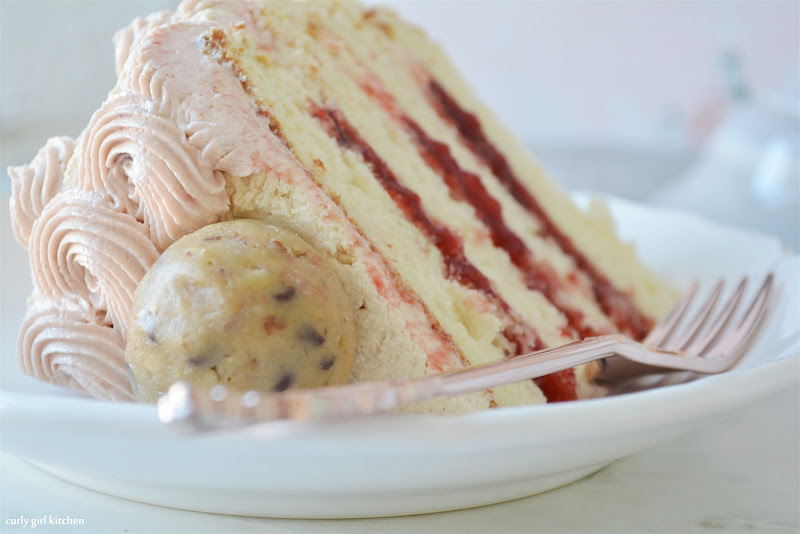 It's the most decadent dessert version of a peanut butter and jelly sandwich that you could imagine. 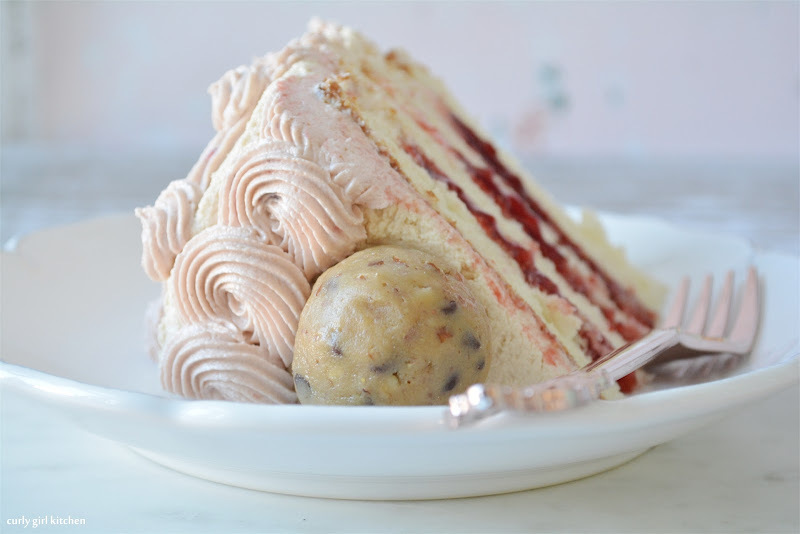 Soft vanilla cake is filled with strawberry jam, and frosted with fluffy peanut butter buttercream that's lightly salted and flavored with vanilla. I thought of using peach or apricot or cherry jam, but ended up going with strawberry, since it tends to be a favorite of most everyone. Next time, though, just to please myself, maybe the apricot. 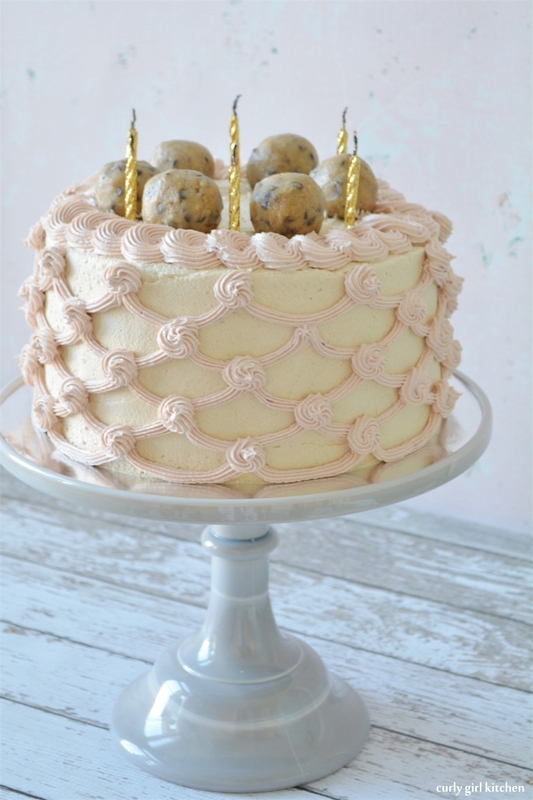 To top off this cake, I made a small batch of cookie dough and rolled it into balls for a pretty, tempting garnish. 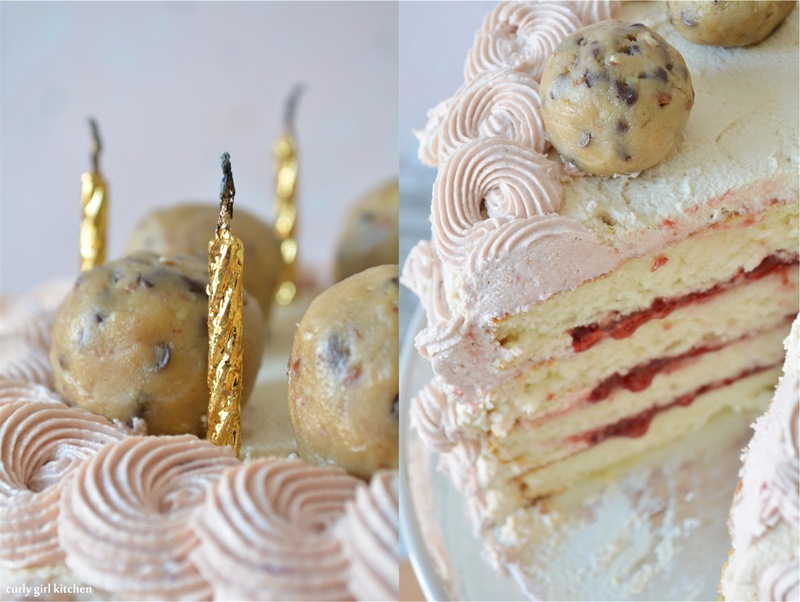 And really, I don't know what's not to love about a peanut butter and jelly cake topped with cookie dough. Bake until a toothpick comes out clean, about 21 minutes. Cool the cakes in the pans completely before filling and frosting. In the bowl of your stand mixer fitted with a whisk attachment, beat the peanut butter and butter until smooth. Add the powdered sugar, meringue powder and salt on low speed to combine. Add the milk and vanilla, then whip on medium high for about 4-5 minutes, until light and fluffy. Fill each layer with the jam, and frost with the buttercream. For the piping, I used a small/medium star tip. You are so creative Heather! Bravo. Do you use all natural peanut butter or something like Jiff or Skippy? 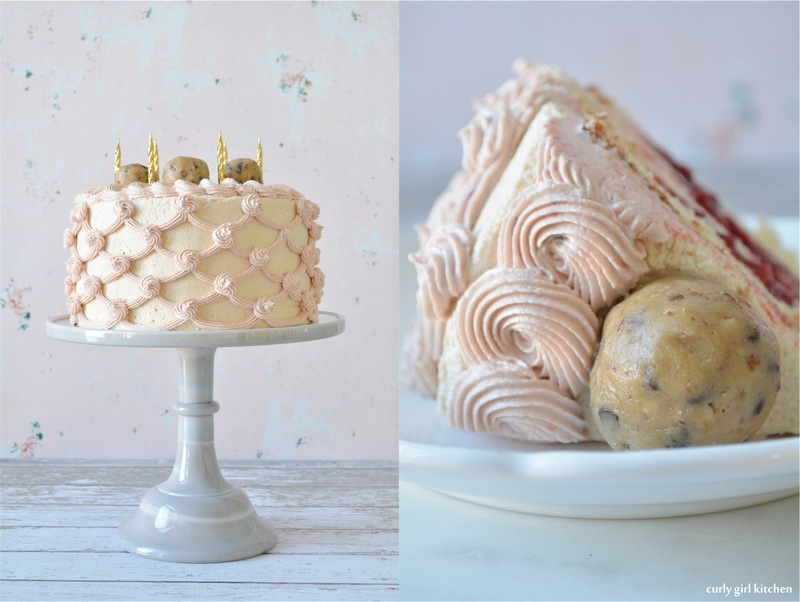 I can imagine that it could change the texture of the buttercream. Good question! 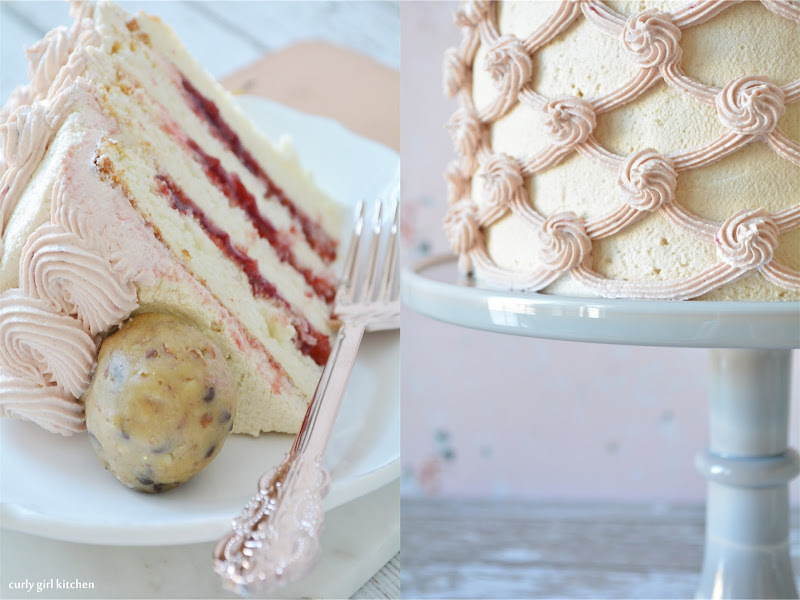 All-natural peanut butter isn't the best choice for baking or buttercreams, so I do use Jiff creamy peanut butter so that it's much more stable and has a better texture. Another beautiful cake! 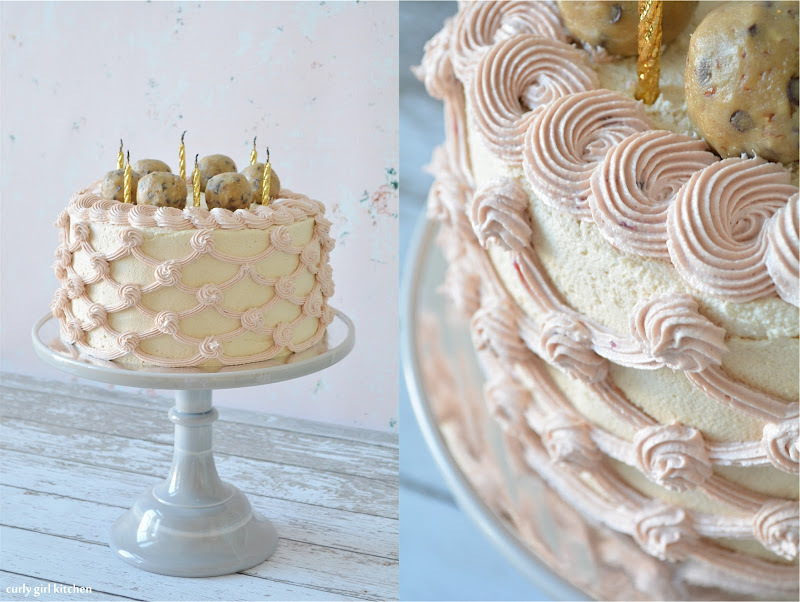 This sounds so nostalgia-inducing--I love anything with PB&J flavors :) Love the addition of cookie dough balls, that is my kind of cake topper!